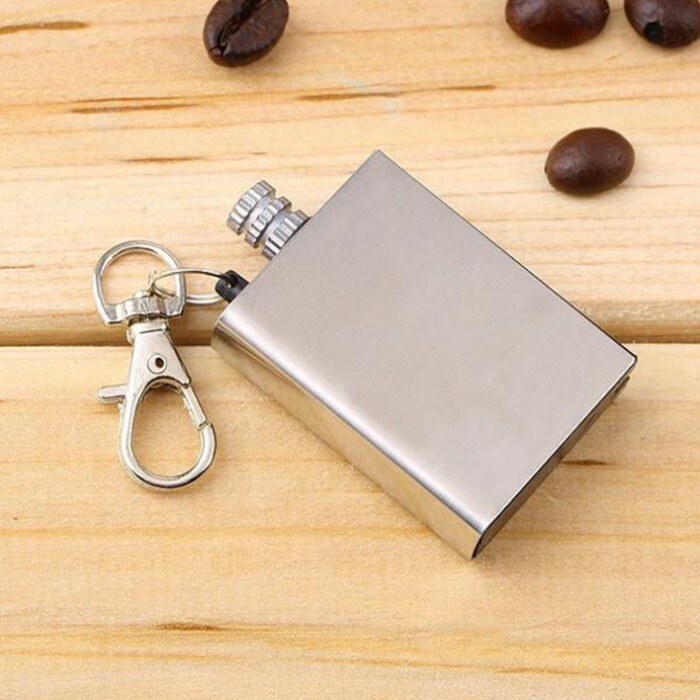 Waterproof Permanent Match Survival Lighter Keychain - Stainless Steel Case, Flint Match, Ferro Rod, Thousands Of Strikes | BUDK.com - Knives & Swords At The Lowest Prices! 2 or more only $3.00 each! 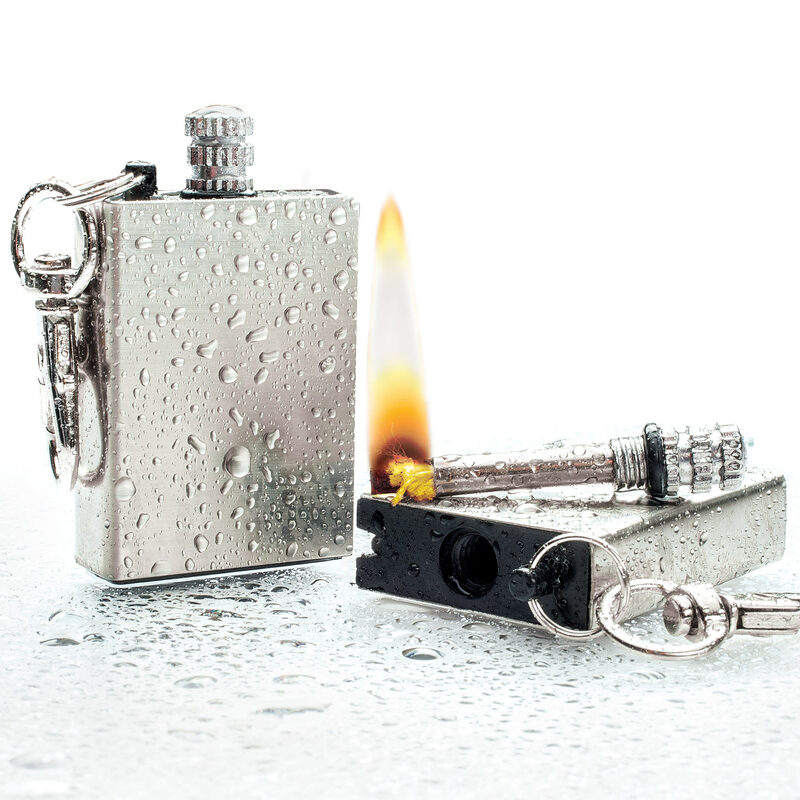 The Waterproof Permanent Match Survival Lighter Keychain is a brilliant survival tool invention that gives you the power to build a fire anywhere and in any weather! Simply twist the metal and flint match from the tough, stainless steel case, strike it on the ferrocerium rod in the side, and presto...it’s lit! The flint match lighter is waterproof, so it will work even after its been soaked in water, making it an essential life-saving tool. 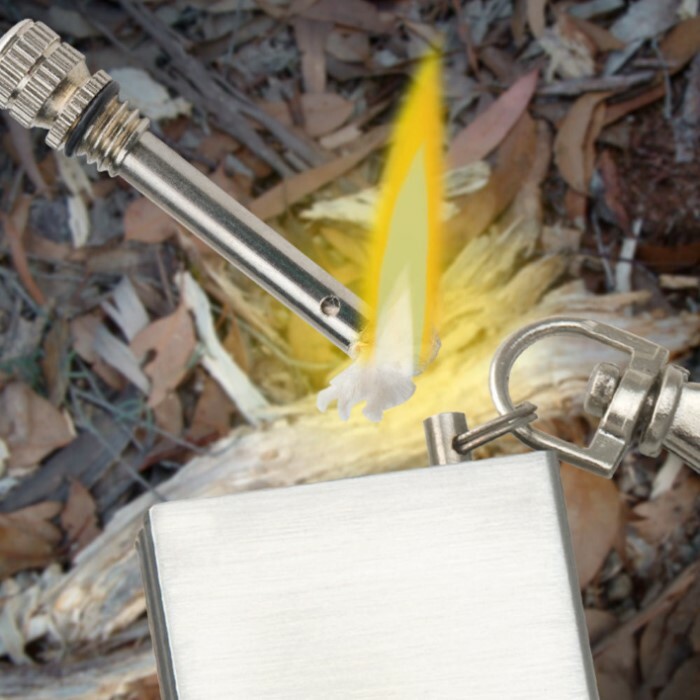 Since the ferro rod strikes over 3,000 degrees Fahrenheit, it allows the match to light up to 15,000 times! 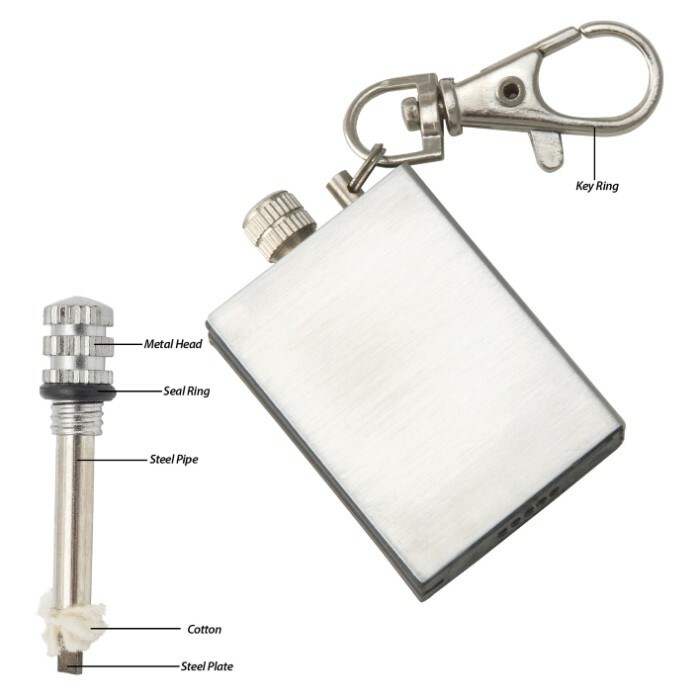 The compact, 2”x 1 1/4” keychain lighter has a built-in O-ring on its screw top to keep the lighter fuel (not included) from evaporating and water out of the case. It also features a convenient, integrated lobster claw clasp so that you can take it anywhere. It is perfect to have at home, in your vehicle, on your keyring, in your toolbox, or in your bug-out-bag. Got a couple some time back. Unique lighting method always impresses people. Just 1 drawback: plastic threads on cap are easy to cross-thread. I purchased one of these and it works well. Difficult to fill without spilling but works good. Seems as though it will last quite a while off a fill of lighter fluid. Good item for survival bag or camping. I bought this for emergency bag Not daily use. Out the box my lighter lit after a few strikes. Sometimes it lights on first strike sometimes it takes a few strikes but always lights. Even outside. Havent refilled yet and had it about a month. I don't use it regularly i only test it every few days. So far i5 is a great buy for three dollars. Will be ordering more soon. Great for camping, have used it often to start a campfire. Works great lights even in the wind. Possibly the best thing I have bought from here. For me it works perfectly every time I need it. The only issue was that it wouldn't light for the first time until I lit the wick with a regular lighter. After that it worked perfectly. Even seems pretty resistant to wind. 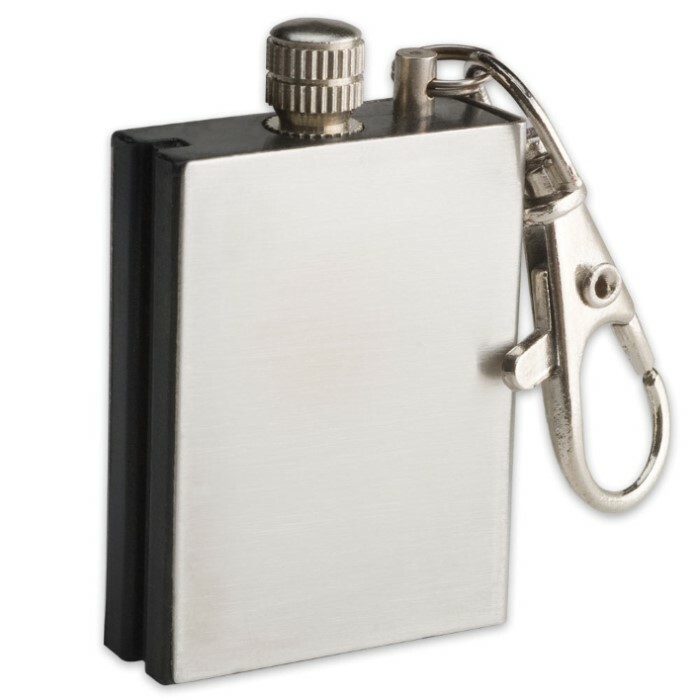 One other thing: Avoid using it to light a smoke because it'll end up tasting a bit like the lighter fluid. Light a piece of paper or lint to start a fire with fluid. also works as a striker with sparks directed into lint. surprisingly functional, more so than a lot of things! I bought several of these to place in bug out kits. Made in China and looks like something you would get out of a vending machine. But, I was pleasantly suprized when I struck the flint built into the side. Lit up with a pretty respectable flame. Maybe not suited to constant use, but will do for emergencies. Very small with a big flame. Make sure it has fluid and it should serve it's purpose.